Bulk discount first aid key chains, custom imprinted or blank at bargain prices. We also supply wholesale blank (not custom imprinted) first aid key chains for $1.15 each (minimum 300). Free artwork design. Lowest prices in USA and Canada for bulk personalized first aid key chains. Unit Prices below include your one color imprint on one side. Two-sided imprint is available: contact us. We also supply blank (not custom imprinted) first aid key chains for $1.15 each (minimum 300). 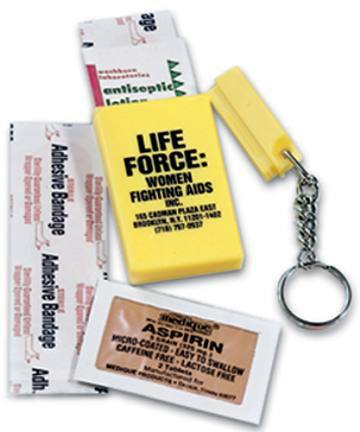 CONTENT: The First Aid Key chain features 1 antiseptic lotion packet, 2 aspirin tablets, 2 3/4" x 3" adhesive bandages and 1 first aid instructions. PACKAGING: Bulk; 250 per carton; 12 lbs.